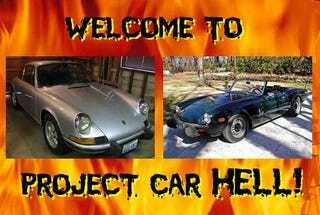 Project Car Hell, Arc-Weld Your Soul Edition: Electric 911 or Electric Spitfire? Welcome to Project Car Hell, where you choose your eternity by selecting the project that's the coolest... and the most hellish! Yesterday, we saw the triple-'49-Mercury deal obliterate the six-four by what may be the biggest-ever margin in Choose Your Eternity Poll history: 80-20 for the Mercuries in the Low And Slow Edition poll. Today we've become so excited over the possibility that the $30,000 $40,000 Chevy Volt will be on the street in the not-so-distant future that we're going electric, and we're not talking about golf carts or even AMCs here- no, we mean electric vintage European sports cars! Project Car Hell, Low And Slow Edition: 1964 Impala or 1949 Mercury Trio? Say your '73 Porsche 911, which you bought brand-new, failed to pass the Washington smog test 17 years later. Would you break out the wrenches and make it pass... or would you convert it to electric power? Exactly! And that's what the owner of this 1973 Porsche 911T did, installing electric motor, batteries, the works. We may have to dock some PCH points here for the good grammar and detailed description (and where's the official eBay CAPS LOCK style? ), especially since the seller has a big website full of info on the project, but don't worry- the hell is still there! See, the electric 911 stopped running after 357 miles, and it's been sitting since 1999. The seller straight-up says "This was an electric car. To be one again, a lot of work is needed." There's corrosion from battery-acid leakage. The brakes are garbooned. There's all the stuff you'd normally have to deal with on a car that's been sitting in a damp climate for a decade. But still, electric 911! Imagine getting this thing geared up for some Tesla-hunting! Could a fully restored, turn-key electric car really be considered a project? You bet... as long as it's a British Leyland product. I don't care how many components you replace, the spirit of Joe Lucas will always come along for the ride in this electric 1980 Triumph Spitfire. The Spitfire is a popular subject for electric-drive conversion; it's small, light, sporty, and the fact that nobody in his or her right mind wants one makes Spitfire deals quite cheap. This one has a 120-volt motor and ten 135AH batteries, and the seller claims it will do 75 MPH. Range? Who knows? The seller says it's at least 35 miles. We suggest ditching all that lo-po gear and building it up to White Zombie standards... well, once you've fixed all the stuff that will break just getting into your garage. Thanks to BZR for the tip!